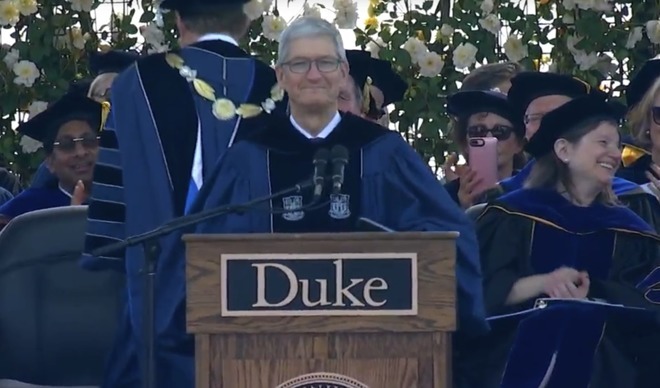 Apple CEO Tim Cook returned to his Alma Mater Duke for the commencement speech for the 2018 graduates, and left to a standing ovation. Cook addressed many topics, ranging from climate change, Apple's use of renewable energy, and issued a clarion call to graduates to leave the world better than they found it. While not an overt call back to Apple's late-'90s advertising slogan, Cook still called on graduates to "think different" and not just accept how things are. "Don't just accept the world you inherit. Don't just accept the status quo," said Cook. "No big challenge has ever been solved, and no lasting improvement has been achieved, unless people dare to try something different. Dare to think different." As with most of Cook's speeches, he invoked Steve Jobs, and thanked the Apple founder for his vision. "I was lucky to learn from someone who believed this deeply. Someone who knew changing the world starts with following a vision, not following a path," reminisced Cook. "He was my friend, my mentor, Steve Jobs. Steve's vision was that the great idea comes from a restless refusal to accept things as they are." "The question we ask ourselves is not what can we do, but what should we do. Because Steve taught us that's how change happens. And from him I leaned to never be content with the way things are," said Cook. "I believe this mindset comes naturally to young people —and you should never let go of this restlessness."